Mags Glavey, Angela O'Connor, Colette Tuohy, Ann McDonnell who won gold at the National 10K championships. Mayo AC were represented by 16 runners at the National 10k Championships which took place in the Phoenix Park Dublin recently. The race was run in conjunction with the annual Great Ireland run, with 5,000 participants taking part in 10k, 5k, and Junior races. The one lap 10k course is relatively fast up to the five kilometre mark, but has extremely tough uphill sections from there to the finish. Conditions were good as almost 500 club athletes competed for individual category and team medals. 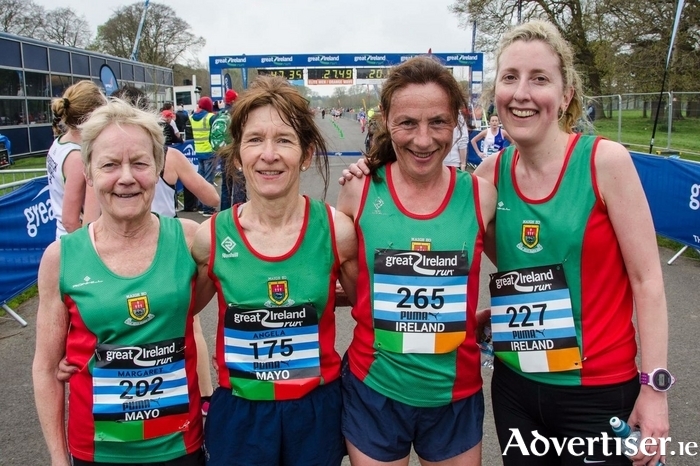 As in 2016, there was major success for Mayo AC women in the masters categories. A huge well done and congratulations to the Mayo AC's age category individual medal winners: Colette Tuohy, won gold in F45, Angela O’Connor, won gold in F50, Pauline Moran, took silver in F60, and Mags Glavey brought home gold in F65. O'Connor, Moran, and Glavey made up the women’s 50+ team and retained their title with a combined time of 2:10.01, over two minutes faster than their 2016 run and 11 minutes ahead of second placed Mullingar Harriers. Just rewards for lots of hard work and dedication – and there were some brilliant achievements by all who represented the club on a big championship day out in the park. Colette Tuohy, Ann McDonnell, and Fidelma Gallagher finished sixth of 24 competing teams in the O35 category 2:13.42 – 10 minutes behind winners Donore Harriers. Sligo AC just beat Westport AC for bronze by 10 seconds. Seán Murphy and Mark Basquille led the seven strong men's squad home. There were two personal best finish times despite the tough terrain - Greg Barry in M45 and Finian Joyce in M55 - an excellent achievement. The men's O50 team finished seventh with David Dinsmore finishing eighth in the O60 race, and Tom Hunt was just outside the medals in the O65 section. Also on Sunday April 9, Paul Reynolds (Mayo AC ) ran an excellent personal best time of 3:03.50 in the Rotterdam Marathon. He knocked over three minutes off his previous best marathon time recorded in Rotterdam in 2016. Well done also to John Geraghty 4:03.06, and Lorraine Toner 4:42.00 who also completed the race. Summer conditions greeted the participants at the Ballinrobe 5k and 10k events. Even though the temperature was warm a stiff breeze took the speed out of the course with some of the faster athletes struggling to get a really fast time. In general most participants recorded fast times with quite a few achieving personal bests making it a brilliant evening for all involved. The events were used to promote Ballinrobe Smarter Travel options and with so many families taking part it is sure to create a precedent for the younger generation. Sean Mc Loughlin of Westport AC stormed to a comfortable win in the 5k race in a time of 16:14 in the gents' race, with the ladies' 5k won by Leah Toher in a time of 21.16. John Byrne, Mayo AC, continued his dominance of the Mayo road running scene winning the 10k by just 20 seconds from Westport's Brendan Gill with Robert Malseed filling the podium in third position. In the ladies' section Kathy Gleeson ran a brilliant 38:27 to win with Galway City Harriers' athlete Siobhan Egan second and Sarah Syron in third position.